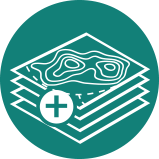 The processing of LiDAR data and Digital Elevation Models is the heart of the OCAD Orienteering edition. 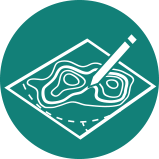 Create contour lines, hill shading or vegetation maps in just one single step. With the DEM Wizard you can analyze your data and derive contour lines, slope maps, hill shading maps or vegetation height maps in a fast and easy way. The step-by-step wizard takes you through the whole developing process. The output maps will be loaded directly as background maps to your mapping project. The LiDAR Point Cloud Manager analyzes the vegetation density within the forest and creates a vegetation raster map. Let you show a profile of the vegetation structure, vegetation boundaries or high trees. In addition to LiDAR and DEM data, import cadastral surveying data, OSM data, display aerial photos or get information from Web Map Services (WMS), Google Maps or Google Street View. Set scale and Coordinate System, transform existing maps into a coordinate system. Import Spatial Information such as Shapefiles, DXF-files, aerial photos or OSM data. The WMS module makes it possible to load maps from various WMS providers. Choose Online Map Services and OCAD opens Google Maps at the same location as your current map extent. Load the Google Map files directly as a background map. Click into your drawing area and drag a direction. OCAD opens the web browser with Google Street View at the chosen position and direction to let you get an impression of how it may look in the terrain. OCAD runs on Tablet PCs. In addition, OCAD has a real-time GPS connection tool and offers a connection to a laser range finder for faster and more precise mapping in the terrain. OCAD runs on Tablet PCs. Draw and update your map directly in the terrain. 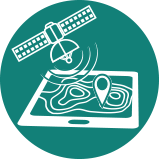 Get all your background maps on your tablet and switch between them easily while mapping. OCAD has an interface to connect with a wireless real-time GPS device. Your current position in the terrain is shown on your tablet PC and makes mapping more accurate. OCAD offers a connection to enable the capture of data from a laser range finder. Benefit from a large number of functions, which makes drawing and editing more easy and accurate. 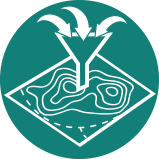 Use the latest International Specification for Orienteering Maps (ISOM) symbol sets for drawing and convert old maps to the new ISOM standards. Adjust your background maps to your georeferenced map with the Rubbersheeting Transformation. OCAD provides a powerful Symbol Editor which allows you to create any symbol you can imagine. 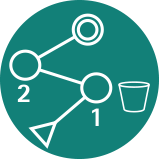 You can also simply use one of many predefined sets of map symbols. The latest ISOM Symbol Sets will always be available and you can convert easily your old maps to the new ISOM standards by help of the Symbol Set Converter. Symbols can involve the status normal, protected or hidden. Save the current status of your symbols in the Symbol Status Manager and reload the different savings at any time. OCAD attach great importance to precise and efficient drawing. The «Bézier curve mode», line tracing and the snapping functions are just some of many drawing tools. Once you have drawn objects, there’s a huge number of editing functions, like reshape, crop objects, move and/or duplicate, virtual gap and interpolate. Use Generalization Tools, like line smoothing or the generalization of area objects to make your map more readable. 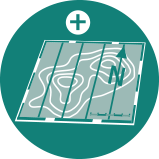 Finalize your map with a layout layer, which allows you to add peripheral information to a map. Export your map to one of the many formats for printing or further use. The layout layer allows you to add peripheral information to a map. Logos, titles as well as other graphic objects such as auto-generated map legends can be added onto the map. OCAD provides you with many export formats, from raster, shape, to desktop publishing formats. For PDF export, choose between true colors or process colors (CMYK). Export an encrypted map which cannot be edited and can only opened by the users you predefine. The Check Legability function checks if your map meets the ISOM 2017 requirements. OCAD provides completely integrated functions for course setting in orienteering, from simple courses to complex relay projects. Set, print and export Normal Courses, Relays and One-man Relays. Always work with the latest International Specification for Control Descriptions. Automatic Control Description supports you with a semi-automatic identification of the control feature. Use the Consistency Check Report to see if your course setting project meets the IOF requirements. Export your courses to timing software.